Appetizers – check! Entree – check! Main course – check! Dessert – check! Cheese – check! This was me, last Friday, skimming through my shopping as well as to do list. Checking of items on your checklist, isn’t that the greatest?! It was already late in the afternoon and I had not only prepared everything that could be done in advance, my timing was much better than usual. The additional spare time gave me the luxury of going through our complete menu once again, and oh gosh, how could I have missed a little something to accompany the cheese course? Grapes, nuts, store-bought mustard or chutneys usually would do a great job, but since we awaited dear friends from Italy, I waived the typical options and turned to my cookbooks for a quick fix. Only minutes later I had drafted Oliver into kitchen service, taking full advantage of his cutting skills. My man loves any kitchen work that involves a sharp knife, so no humbly beseeching was necessary and the big pile of red onions for a homemade confit was sliced up in no time. Now I had everything at hand that the recipe asked for and in less than an hour I was filling the enticing result in one large and two tiny glasses. As usual I couldn’t help it and had altered the recipe to my liking, substituting orange juice for water, port wine for red wine and thick, aged balsamic vinegar for regular one. While the onions turned into a glossy, sweet-sour delicacy, Oliver and myself couldn’t stop tasting directly from the pot and an odd thought came to mind: why not serve this confit with a little cheese – instead of cheese with a little confit? Heat the butter and half of the olive oil over low to medium heat in a large pot and add the sliced onions. Cover with a lid and cook for 10 minutes while stirring occasionally. Add the thyme sprigs, the bay leaf and muscovado sugar, then season with sea salt and freshly ground black pepper. Cook uncovered for 10 to 15 minutes until the onions are tender. 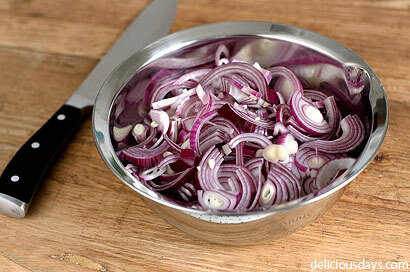 Again, don’t forget to occasionally stir – the onions are not supposed to gain (much) color. Add the finely chopped prunes and the liquids: the orange juice, the balsamic vinegar and the port wine. Adapt the temperature until the mixture slightly simmers and keep stirring regularly until most of the liquid has evaporated, about 15 minutes. Finally add the remaining olive oil (gives a nice, glossy finish) and season to your own taste. More vinegar for an extra tangy note? A bit more pepper to spice things up? Hey it’s your canvas confit, you can do it! (sorry B .Ross came through) Keeps in the fridge for several days. Wow does this ever sound good. Who needs cheese? I'd have to stop myself from just eating the onions! I have an Oliver at my house as well - he's only 12 years old but he's still a great help in the kitchen. I love love love cooking with port wine. This looks delicious!! A nice detail to add to any table. Oh, I can't wait to try this! I have an unnatural love of onions, especially now in Italy since they don't use garlic as much as I'd like...I think I'd spice this up with some hot pepper flakes, too! I started making chutneys recently and now I'm overwhelmed by the possibilities. I have to add your confit to my list, it looks very good. Oh, marvelous! With some good cheese and homemade bread, it must taste heavenly! Sounds delicious! It reminds me of a similar onion confit I made a while ago to go with some foie gras, which was also a very nice combination (I don't eat cheese...). Besides a really nice aged balsamic vinegar I used "normal" red wine - next time I'll follow your suggestion with the port! Looks great, I have made a similar one with Sangiovese. It spruces up sandwiches as well with its luscious flavours! I have a similar recipe that goes very well with duck. It uses red wine vinegar, so it has a little sharpness to it. Your confit would make a great crostini with goat cheese or sharp cheddar. My GFs father made some onion confit to go with his fondue on new years eve. He used red wine and thought the result was not as impressive as supposed. So I had the pleasure of tasting the remainings, and i ate them all together with a steak. Despite thinking it was really tasty i had to agree that it lacked some.. flavour. Now i know: it is the port. It is not a coincidence that one of my favourite sauces with steak is made from port or sherry with onions and fresh thyme. So it seems perfectly sensible to do it the other way around and use a lot of onions and a little bit of liquid and make a confit. Onions and port are a cmbination born in heaven. I'd skip each and every desserts for a good cheese course! 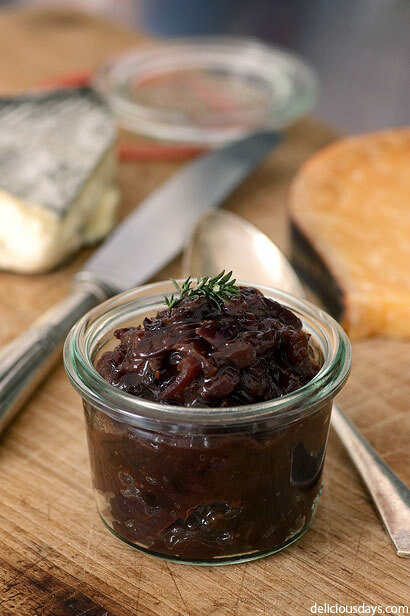 Oh I absolutely love onion confit (I always seem to call it marmalade, but same thing really). There is a wonderful recipe in Cooking for Mr. Latte that uses thyme and blackcurrant liquer...as long as you're using the good stuff it is delicious! This sounds like the perfect little something to bring to a dinner invitation. Do you think I could skip the prunes? mmm... with a little bread this would be fabulous! Great!!! You always have wonderful ideas and recipices! I love confited onions, here in Spain we use them a LOT with meats and veggies, and really anything, but we tried it with pasta last weekend, and what a huge success it was, please give it a try, just mix it with plain spaguetti already cooked and a generous amount of this confit, your favourite cheese, grated on top, and you have a wonderfull, cheap but gorgeous new pasta dish. Love it!. I will have to give prunes a try again since I think I was traumatized form childhood. Please consider entering the 'Eating your Words' challenge at my blog. I think your entry would be amazing. Me encanta la cebolla confitada, esta receta se ve deliciosa y acompañada con quesos, mmm! I've just fallen in love with your site and just started making confit - last weekend garlic confit - it's delicious and super convenient to have on hand. By the way - is that a weck jar? I served this together with roasted potatoes and grilled flank steaks, a great combination! My husband loved it and I received some lovely compliments. I just made this the other night. I a encrusted the filet mignon in smoked paprika, cracked peppercorns, garlic salt, kosher salt, chili powder and seared with butter on med-high heat in a cast iron skillet. Finished the steak with the onion confit and goat cheese crumbled. I made a balsamic vinaigrette with chopped strawberries, toasted almond slivers, goat cheese, shallots, on a bed of baby arugula. Along with a side of roasted white asparagus and pink peppercorns. Delicious!!! I live in Holland, but I've been reading the German food monthly "Essen und Trinken" for ages now. In December edition, I think, a review about your book was printed. It was the first time I heard the word "blog", but being not overtly fond of internet (I love books - reading, buying, but unfortunately not writing them) I decided to order your book at my local bookstore based on the review only (very untypical of me, I must say). Since I got the book I've been facing quite a dilemma each week - should I read or should I check your blog? Up till now I've tried most of your recipes from your book (pittole and schmalzküchlein are an absolute hit with my guests). However, the onion confit from your blog site beats them all!!! By the way, yours is the only site that I actually visit and read. I'm looking forward to your new ideas and stories that go with them. Thank you. Do you think this could this be safely water-bath canned, given the combined acidity of onions + vinegar? Do you think this would be good canned for eating later?